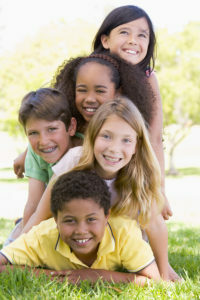 Children are very welcome at Fischl Dental Associates. Many of our adult patients began their dental experience with us as children. We enjoy the relationships that are a part of seeing your entire family. While we are seeing fewer cavities in most children compared with a few decades ago, it is still very important that children are seen regularly for dental examinations and cleanings. Small problems caught early are almost always easier, faster and more comfortable to treat. While baby teeth will eventually be replaced by adult teeth, it is important to take proper care of them, as they perform a very important role in maintaining orthodontic spacing for those adult teeth that will follow. Large untreated cavities in baby teeth or premature loss of baby teeth may lead to a shift in the bite that could lead to more complicated orthodontic issues. For those children with severe or multiple decay issues, and for those children with challenging behavioral issues, we will recommend that the child see one of our wonderful, nearby pediatric dental specialists. For the child making their very first dental visit, it is important to us that we make it as positive an experience as possible. We want your child to look forward to their visits to Fischl Dental! We do offer dental sealants and fluoride treatments to our young patients, when appropriate. We would always rather prevent cavities than fill them. Check out the video that shows how to care for your young child’s teeth at home. We look forward to seeing your child at Fischl Dental Associates!